In our over 35 years of combined legal experience spanning two generations of the Sawan family, we know all too well the damage a car accident can cause. Your life can change in an instant. 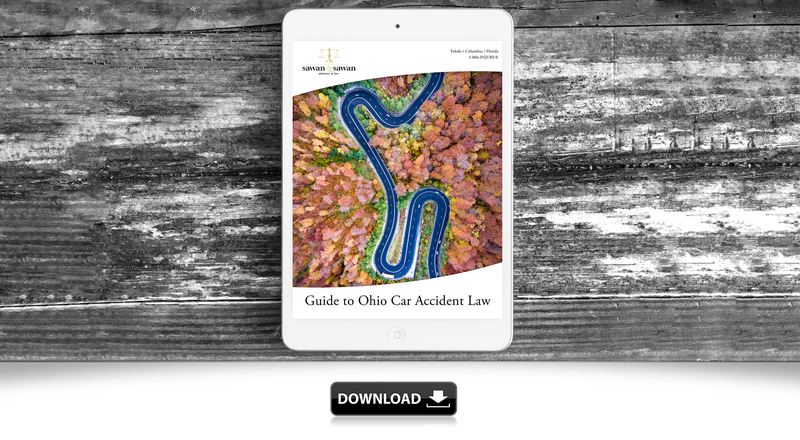 Because we’ve seen the confusion after a car accident first hand, we decided to create and publish this guide to Ohio Car Accident law to provide some information we think all victims of negligence should know. Need a Guide to Navigate Your Car Accident in Ohio? In 2014, the Ohio Department of Public Safety (ODPS) reported 282,368 total traffic crashes in Ohio. Of these crashes, 69,917 caused injuries and 919 resulted in at least one fatality. The devastating effect of these on Ohio families cannot be overstated. Alot of people understandably expect that, after a car accident, insurance companies will offer a fair settlement based on the all of the costs associated with the accident. Unfortunately, many victims find out too late that this isn’t always the case. Without aggressive and smart representation, car accident victims can be left with little or no compensation due to inadequate insurance coverage or because they made a serious mistake when filing their accident claim. As a family of lawyers, we take our client’s legal matters personal. We recognize the impact a car accident can have on a family, and we fight relentlessly to ensure the insurance companies and responsible parties play fair. After an accident, the first step is the document everything you can remember. One of the best ways to do this is by getting the police involved. A police report creates an independent account of the aftermath of the event, which serves to protect vital evidence close to the time of the event. Remember to never leave the scene of an accident prior to making a report, as it is often a crime. In order to get the most out of the police report that is generated, it is helpful to review where some pertinent information is located. 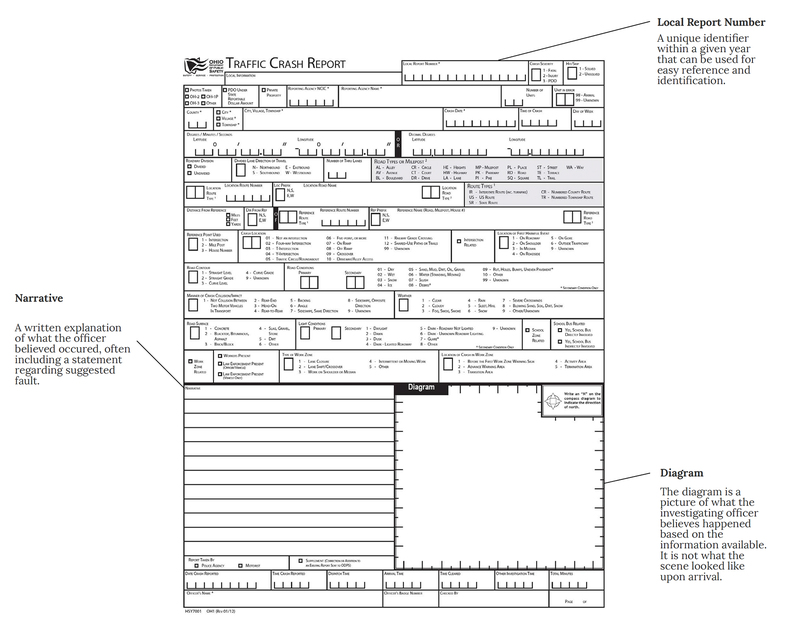 Below is a blank example of the HSY7001 form used in most jurisdictions in Ohio. Insurance coverage is an often complicated and highly technical area of the law. Many times, clients purchase an insurance policy without fully understanding the specific contours of what is covered. Also, since all car accidents are fact specific, coverage can often be unclear until a thorough review of the policies at issue is completed. However, even though every insurance policy varies, there are certain types of coverage language that is typical. Understanding these coverage types, as well as the way they interface with one another is critical to navigating the contours of an insurance claim. There are often different amounts available for the different types of coverage. The types of typical coverage are as follows. Bodily Injury Liability (BI) – BI is mandatory coverage in Ohio. Drivers must carry at least $25,000 per person and $50,000 per accident. BI pays for injuries others suffer in an accident caused by you. If another driver caused your wreck and you were injured, you will file a bodily injury liability claim with the at-fault driver’s insurance carrier under their policy. Property Damage Liability (PD) – PD is another mandatory coverage in Ohio. Drivers must carry at least $25,000 of coverage which pays for damage you cause to another person’s vehicle or other property. Again, if another driver caused your wreck, you will file a property damage liability claim with the at-fault driver’s insurance carrier under their policy. Medical Payments – Medical Payments is an optional coverage that covers medical and funeral costs for you and your passengers regardless of who is considered at-fault. Uninsured Motorists (UM) – UM is an optional coverage which covers your damages up to your policy limit when a driver who does not have insurance (or who leaves the scene) caused your accident. Underinsured Motorists (UIM) – Underinsured Motorists Coverage is an optional coverage for your damages up to your policy limit when they exceed the at-fault driver’s policy limits. Collision – Collision is an optional coverage under your policy which covers damage to your vehicle, regardless of who was at-fault, after you pay your deductible. If another driver was at fault, your insurance carrier will ask the other carrier to pay for the damages and pay your deductible back. In Ohio, an injured party bears the responsibility of proving their case should the matter go to court. This means that it is absolutely vital to collect evidence at the scene of the accident or shortly thereafter. If the police fill out a police report at the scene of the accident, it should include much of the information you will need. However, it is always a good idea to get certain information for yourself. Never allow the destruction of any evidence, including the cars involved in the accident until you have spoken with a qualified lawyer. In instances where liability is disputed, the cars themselves can be the most valuable evidence available. A car accident reconstructionist can use the damaged vehicles to accurately determine a whole host of facts. If you are able to after an accident, use your camera. A typical car accident claim can take months or years to resolve, and as such, an accurate memory of the damage from the accident and the location of cars can prove vital. Memory can be questioned, a photograph is much harder to cast doubt on. Whenever you can, take as many photographs as possible and make sure to send them to one of our attorneys for safekeeping. Remember, the Attorneys at Sawan & Sawan work on a contingency fee, meaning that it costs our clients nothing to schedule a free consultation about your case. We’re here to help. Internal insurance company documents show that they track the different lawyers involved in a case, including success rates and experience, and adjust settlements offers according to the perceived risk of losing a lawsuit against that lawyer. While you have a duty to cooperate with your own insurance company, you should never do anything that may negatively affect your legal rights without first consulting a lawyer. State you are happy to cooperate and will get back to them within a reasonable time period. In virtually all cases, an attorney can work on your case to ensure your recovery is full. You can be sure that those representing the negligent party— usually an insurance company — will be lawyers working to pay out as little as possible. The calculations made by the opposing attorneys are based in large part on how aggressive they feel the injured party will fight for full compensation for the harm caused. When you retain the services of the Attorneys at Sawan & Sawan, you are ensuring that you are not taken advantage of by the other side. Your lawyer should be experienced in these matters, so that very specific information can be gathered to ensure all of your damages are accounted for by the other side. Documentation and organization are vital to success. If the other side is not cooperating, the attorney must be prepared to take the case to court to ensure full and fair recovery. Knowing that you are willing to go as far as necessary to ensure justice by obtaining legal counsel often means that the opposing side will deal more reasonably right from the beginning. Also, all claims in Ohio are governed by strict time limits for filing a claim. An experienced lawyer can help protect this right. Typically, a party involved in a car accident will be quickly called to and asked to give a recorded statement. You may be wondering if you have to or should give one of these. The short answer is NO. While it is true that you have a duty to cooperate with your insurance company and give them a statement, this does NOT require that you give a recorded statement to the other side’s insurance company. Insurance companies will go to great lengths to secure these statements because they know that they can misinterpret statements to serve their interests and limit responsibility. In fact, you should never give a recorded statement until you have consulted with an experienced Attorney. This guide to car accidents in Ohio is an ATTORNEY ADVERTISEMENT for the Ohio car accident attorneys at Sawan & Sawan LLC. Sawan & Sawan is an Ohio based car accident law firm with Ohio car accident attorneys licensed to practice law in the State of Ohio. If you were in a car accident in Ohio and would like to speak further about your specific legal matter, call Sawan & Sawan today at 1-866-INJURY-0 or 419-900-0955 to schedule a free consultation.